It’s been quite some time since I’ve shared my voice here at Lone Gamers but readers I have returned! Today we bring you a review of a unique title in the surging online TCG market: Fantasy Rivals. I have over ten years of TCG experience from the multiple paper TCGs and the numerous Online TCGs I have tried many and thought I have seen most of what people have to offer. Fantasy Rivals caught me off guard immediately. What do you mean? 8 Cards in your deck? Right off the bat, just from that little bit of information, I knew I was going to be in store for something different. I’ll admit I was a little abrasive about it but with how the gameplays it feels right. Ok let’s break down the basics. Once you have your deck of 8 heroes you can start a game. You start off with one already in play and at the start of each turn you look at four cards selecting one all while your opponent is doing the same. Both players then select 1 of the 2 heroes in play to fight. Here is where the strategy comes in. You then secretly select how much mana to add to your hero. Now they fight and you multiply your mana added by the attack your hero has and whoever has the higher attack wins. When your hero wins they do damage to your opponent in the amount equal to their damage value which is a different number than their attack value. Each player starts with 15 life points but you can win without taking your opponent to 0 as the game is only 4 rounds. The player with the most life at the end of the 4 rounds is the victor. This makes for some interesting strategies and fast gameplay. That’s the basics of gameplay. Now like most TCGs there is of course much more that can go into the strategy but that will give you the basics of what to expect. The other key aspect of any TCG is deck building. With 8 cards you can ask yourself “Can 8 cards really offer that much depth in deck building?” If your answer to this question is no they you my friend are certainly wrong. They offer a variety of factions all with their unique flavor and abilities. With the option to combine cards from each of the factions it gives you all the variety of possibilities any other TCG can offer you. Of course when we talk about deck building we want to talk about OP cards or the expensive ones. Yes it’s a TCG so you are going to have to grind your way to earn the better cards but that is expected. You can also shell out some cash to get them quicker but none of this for me was off putting. I was still having a ton of fun playing and learning the game with the weaker cards. As I got deeper into the deck building with a full stock of cards and wow some of the combos you can set up are quite fun. There seems to be a far amount of balance. I’ve played games where it was close coming down to the last round and I’ve played games where I or my opponent have just won outright. After every game so far I’ve come out learning something and with a positive experience. With this type of game play it allows for a lot of bluffing and going all in on one hero to do maximum damage. While playing I kept having a feeling like I was playing poker. Most games require a download which I can’t do at work but with Fantasy Rivals I was able to sneak in a few games with it being available to play in browser. It is also available for IOS and Android devices. The fast paced gameplay and quick games make it perfect for your mobile device and on the go life style. A clean UI makes any gamer happy. Fantasy Rivals delivers this in impressive fashion for a game only in beta. 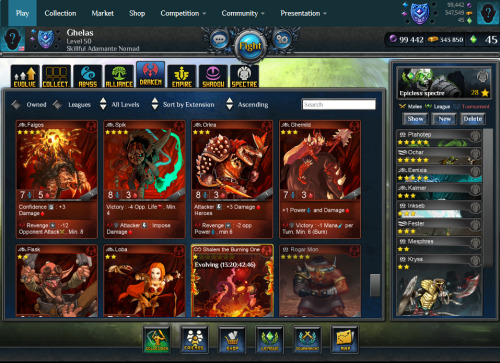 The in game UI is clean and understandable, while the various menus and shop screens are easy to use and navigate. I’ve dealt with too many games where their UI made the game almost unplayable. One thing that most Online TCGs don’t thrill me with is music and SFX. 99% of the time I mute or put the volume down real low. Fantasy Rivals didn’t have me feeling this way though. I enjoyed the ambient noise and fight music. The sound effects and voice acting of the heroes during the battles was also highly enjoyable. I know this isn’t a make or break issue for a card game but it was something that I found myself very impressed by. With a casual and competitive system already built in while it is still in beta puts them ahead of some other games that are even further along in development. Currently playable in both browser and on IOS/Android platforms for you mobile gamers. Hopefully it has the same feel and appeal on mobile as it does in browser because Fantasy Rivals is tailor made for that platform. With its quick to use menus and fast paced gameplay you can easily play on the go. If you’re looking for a game that is a bit different and innovative you may want to take a peek at Fantasy Rivals. I can add that in case if players have some questions,need help with deckbuilding, or share opinions sugestions FR community is always there to help you out and discuss every idea 😀 all you have to do is go to the forum . Fantasy Rivals, despite being the successor of Urban Rivals, has failed to deliver a compelling enough game to truly come into its own. As a player who has reached diamond tier in league and collected several of the rarest Epic cards, here is my honest review of the game. 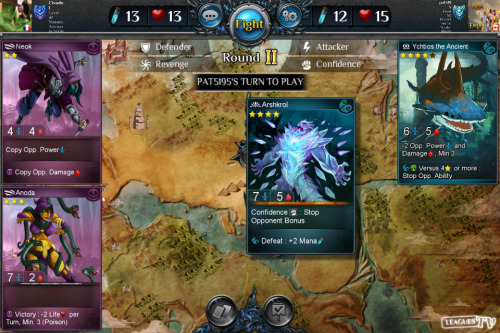 Launched in 2013, Fantasy Rivals has had every opportunity to differentiate itself from the TCG/CCG genre. It certainly has an intriguing premise in its purported offering of psychological play. Unfortunately, the game’s declining player base, poor tournament showing, and inactive forums ultimately belie its lack of popularity. Why is this the case? Let’s start with the game proper. The premise of psychological battle between strategic players is a false one. The game is inherently unfair and pay-to-win because certain Epic cards have tremendously overpowered abilities that are difficult to counter. It is possible to lose 3 rounds out of 4 and still win with an Epic card such as Oljaneik which can create a winning gap of 9 up to 15 with fury. Other Epics like Deelenar, Miselai, Gladia, Noeptus, Patrician are guilty of the same. Unsurprisingly, these Epics typically cost more than 300k gold on the market, which is a grind for any casual free-to-play players. For reference, each winning battle gives 5 gold. It is possible to get jewels from missions and daily league battles in order to open booster packs for the chance to get Epics, but the grind remains odious. Playing as a beginner often means losing again and again against decks that are vastly more powerful and more expensive, with little outplay potential. This is the very definition of pay-to-win. Because of the low population base, the matchmaking system is wholly unbalanced. Beginner bronze players under level 10 can be matched against diamond or master-ranked level 50 players. As can be expected, the experience is very frustrating and discouraging. This is the norm across all three competitive modes – melee, league and tournament. The tournament is a time-limited mode that alternates between Epic and Epicless rules. This mode is foundamentally flawed. It exacerbates all the worst aspects of the game. It allows players to form decks from the most overpowered cards across all extensions. New players do not stand a chance and should avoid this mode at all costs. The low population virtually guarantees that they will play against the same players and decks over and over. Experienced players know to “farm” this mode which has caused severe price inflation in the already unpredictable market. The game has badly designed UI. There appears to be no desire or no manpower allocated to game infrastructure or coding. This is why there are game-breaking bugs that have existed for months, why much sought after features like guilds are nowhere on the horizon, why tournaments cannot be redesigned, and why there has been no significant change to the UI design and implementation in forever. There is lack of communication and adherence to development schedule as promised. Deadlines for the release of information on the most recent Cinderpeaks extension has come and gone. Staff has promised mission overhaul, improved tutorials for new players, but these have not materialized. Ultimately, the game does not seem inclined to attract and retain new players. Instead, the push for the new extension rather than to address more pressing structural problems suggest a last-ditch cash grab from old players. I am not optimistic about the long-term potential of this game. In short, keep away, far far away. DudePerfect, all the points in my review are true. I have been burnt by the game, having spent a lot of my time to get to diamond rank in league and collecting some of the most expensive Epics. I don’t want to see new players get tricked into playing this game. So far, there has been ZERO development on the game. Look at the forums, facebook, twitter – all inactive. Urban Rivals still has weekly events, regular updates and a bigger player base. Play that game instead.